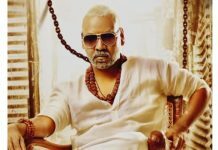 KGF, fondly known as Kolar Gold Fields, is a periodic film primarily set in the 1970’s and at that time the war between USA and Russia tore the world apart and nearly led to the 3rd World War; and the gold prices surged. India’s oldest gold mine was none other than the Kolar Gold Fields. What if it was controlled by one man? The movie traverses the life of one man from his birth, rise, the influence of his mother’s last words, destiny and an insatiable thirst for power. KGF is made in two parts, the first of which is titled KGF Chapter 1. KGF with a great start and unanimous positive talk is creating an all-time record collections ever in US territory for any Sandalwood movie. In this Christmas and Holiday season, to facilitate a happy viewing for the audiences across the US, we’re giving you a heads up on special offers you could avail to watch the film. AT&T customers on Tuesday can make use of the “Buy 1 get 1 Free” offer. Atom App + CHASE Pay Offer : Users can book their tickets using Atom app and get $7 off the ticket using the coupon code “HOLIDAY7” and another $7 off when you choose CHASE Pay as your payment gateway. Create new account with new users and email id to get this offer. T-Mobile customers can avail TUESDAY offers, Please check https://www.t-mobile.com/offers/t-mobile-tuesdays for T-Mobile offers. Sinemia, another subscription-based plan offers users the opportunity to watch this movie for as low as $3.99. Please visit www.sinemia.com for further details on available plans. 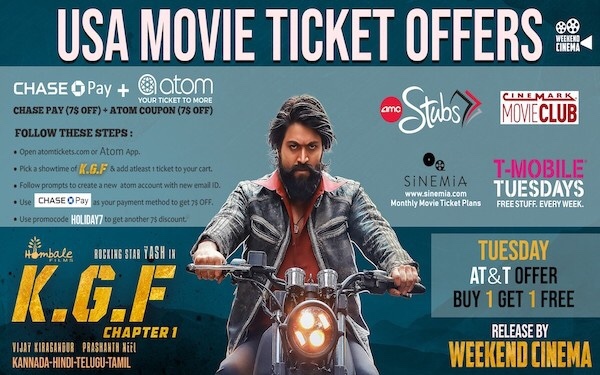 Well, it’s time to get your hands on those tickets to check out the Blockbuster KGF which is creating tremors with its collections in USA in Kannada-Telugu-Hindi-Tamil languages. Weekend Cinema (USA), the overseas distributor of this film are ADDING NEW THEATERS acrossUSA to ensure the film reach wider audience. CLICK HERE!! for Theaters and Showtimes. Weekend Cinema (USA) Wishes all the Readers ofTelugu360 a Merry Christmas & Happy Holidays! Next articleWhy Mamata gave a cold response to KCR’s Federal Front?